AiPT! 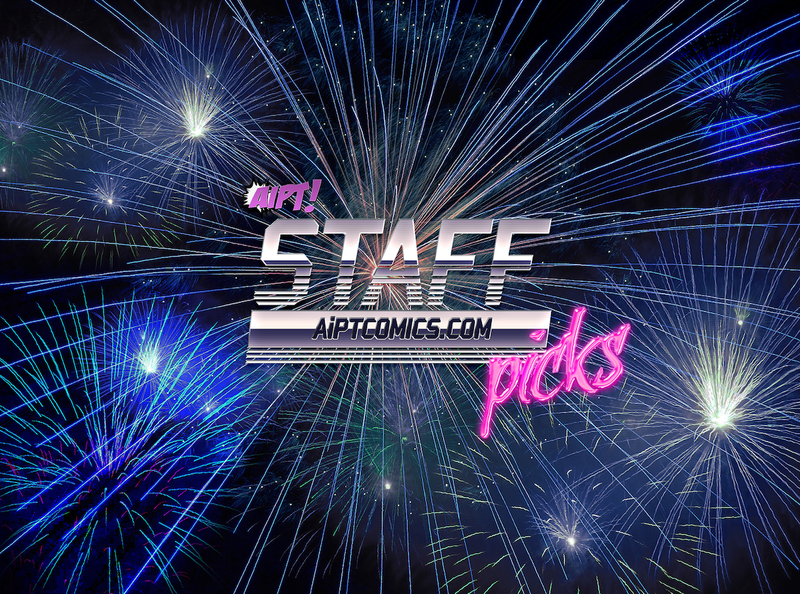 Staff Picks – July 2017 – AiPT! Comics, film, games – at AiPT!, we love it all! We’re also very generous, which is why we want to share what we love with you. Here are our staff picks for July 2017! How was your Fourth of July? : It was fairly low-key. We did witness quite a lot of fireworks in the surrounding area. Everyone around us was launching rockets and lighting up the sky. Favorite Current Comic Series: My favorite comic series is The Power of the Dark Crystal by Jim Henson, Simon Spurrier and Kelly Matthews. I am a huge Dark Crystal fan so you can imagine how excited I was to discover there was going to be a continuation of the original movie in comic book form. The new series is a fantastic tribute to the original. Readers will be swept up in the beauty and mystery of Thra and its inhabitants all over again. I also just started reading Earth and Skin by Lights. If the next issue is as good as the first it may become another of my favorite series. It’s based in a post apocalyptic world that, thankfully, does not include zombies. Earth and Skin sheds a light on relevant topics, such as opioid addiction and our intolerance for difference in an entertaining and visually captivating format. Favorite Current TV Series: I have been disappointed with a few of my favorites in their latest seasons. For example, Orange is the New Black seems to be floundering with its storyline. Normally, I would have binged it all the first week it was released, but I’m having a difficult time. Hmmm… well I guess I have to go with GOT. This season of Game of Thrones is all about the women of the seven kingdoms. We have been eagerly anticipating Daenerys arrival with dragons in the lead and Arya’s revenge. Sansa has developed into a skillful leader despite being second to Jon and I believe she will be the one pulling the strings in no time. Do not make the mistake of discounting Lyanna Mormont either, she is a fierce young woman who makes decisions for the betterment of her people. And of course there is Cersei who is not happy unless she is seeking revenge or torturing someone. These women will drive this season and I can’t wait to see what happens next. Last Great Movie You Saw: Hands down, The Big Sick. I loved this movie! It was touching, dramatic and funny. You could relate to the characters and above all it is a true story. Do not pass this over because you think it is going to be a sappy romance – it is far more than that. This is a must-see. Current Gaming Addiction: I am not a traditional gamer, I like games I can play on my phone. I was obsessed with Cookie Jam and then Gardenscapes but have moved on to a time management game Rakes to Riches. I like that you can prepay for a certain number of levels of play. Unlike Gardenscapes where they were constantly making it so you had to buy add ons to win levels. Rakes to Riches has a storyline component, a time management piece where you move landscapers throughout a property to repair elements and a villa that you are repairing with your winnings. It’s a great way to have some mindless fun. As you can see, my villa still needs some work but the grounds are coming along. Coolest Recent Purchase: Cool for me but probably not for others. I recently bought a silver twig ring. The ring is made to look like four silver branches wrapped around your finger. Biggest Pet Peeve of the Moment: My biggest pet peeve is when people talk crap behind your back. If you have an issue with me, please speak to me directly. It is cowardly to complain about someone to others. If you have a problem with someone talk to them. How was your Fourth of July? : I must be getting old because the 4th of July was less than a week ago (as I write this) and I can’t honestly remember what I did. I assume I spent time with my family and beyond that age has taken from me. Favorite Current TV Series: Typically during the summer I catch up on my DVRed shows that I didn’t have time to watch during the regular year. These are often the lesser shows that I’m just not that excited about but I keep watching out of loyalty or curiosity. One of the those shows that I just finished up, I had forgotten how good it was. I ended up watching the entire season in only a few days; Better Call Saul. Despite being a prequel to a fantastic show (Breaking Bad), Better Call Saul is a fantastic show in its own right. I only felt there was one episode in the second (and current) season that slowed down the momentum that was built up through the whole thing. Overall, it was a fantastic season of a fantastic show that didn’t let up through the end. A must-watch in my opinion. Last Great Movie You Saw: To date I have only seen four movies this year, and three of them were because of/with my 7-year-old daughter. I’m pretty sure we can assume Chicken Little and Smurfs: Whatever the Hell the Last one was Subtitled are two movies that will never be on anyone’s list of “last great movie you saw.” So what was left? Well, I think we can include both of the other two movies under that heading. Both Wonder Woman and Logan were outstanding movie-going experiences that left me both pumped up and not let down. And any movie that has my daughter chanting “Wonder Woman, WONDER WOMAN!” as they leave the theater has my two thumbs WAY up. Current Gaming Addiction: Currently, I’m not much of a gamer myself but I used to play a lot back in the good ole days of Halo 2. But then time became scarce and beyond that having a kid really zaps away your time to do console games. That being said, I have been really working hard on beating the Star Wars: Puzzle Droids app. It is like Candy Crush with a Star Wars skin to it. Basically, you are walking through BB-8’s memories and after each board you defeat you unlock new memories. I know it’s stupid, but I can’t help trying to beat it all. I’m almost 100% on the second level (Takodana) and have just opened the third level (The Death Star), which theoretically will switch gears to be about R2-D2 instead. Coolest Recent Purchase: My coolest recent purchase is not an item I actually get to keep but an experience. I have finally been able to travel to Banff National Park and Glacier National Park. One of my life goals as a geologist was to see a glacier in real life (especially since they are disappearing faster than Comic-Con exclusives) and I have finally made that dream come true. The cost of admittance to one of the nice lodges up in the region was just a cherry on top of the cake. Biggest Pet Peeve of the Moment: I’m going to go a little sciency on you for a moment. My biggest pet peeve is people who feel that after a couple of hours searching on Google (I’m giving them the benefit of the doubt) is equivalent to a scientist’s or a medical professional’s years, often decades, of study and work. I’m sorry but vaccines work and don’t cause autism, evolution is real, climate change is happening whether it affects your pocketbook or not, and GMO’s really aren’t that bad for you. Rant over. If you would like to speak with a scientific specialist on any of the topics I have raised, I’m sure I can point you into the appropriate direction. How was your Fourth of July? : My July 4th was okay. It was just another normal day of going to work and hanging out at home afterward. Favorite Current Comic Series: There’s so many (of course), but I think the title that has me the most consistently excited right now is Iceman. I’m a lifelong X-Men fan, and a gay man who grew up wishing I saw more people like me in mainstream comics, so it feels really emotionally important to me. But even besides that, it’s just a good comic. It’s fun, with nice art and bright coloration, and has not only a lot of Bobby’s signature bad jokes but also touching character development. Seeing Bobby struggle with things I’ve personally struggled with has been a real treat since the series began. Favorite Current TV Series: RuPaul’s Drag Race. Season nine just wrapped up with probably the best finale in the show’s history, so I’m still riding the excitement high from that. Season 10 and All Stars 3 can’t air soon enough. Last Great Movie You Saw: It’s not new, but I just recently saw Moana for the first time. Musicals are hit-or-miss for me, but the soundtrack was great, with songs that were both amusing and uplifting. Not to mention that the animation was beautiful, the animal mascots were adorable, and the antagonist (Te Ka) was amazing. Overall, it was a very heartwarming movie. Current Gaming Addiction: I just finished Orwell from Osmotic Studios. It has a really interesting gameplay setup where you play as an employee of a secret government surveillance program, reading suspected terrorists’ e-mails, wiretapping their calls, etc. You have to try and decipher who is guilty or innocent, all while debating which intel to report to your bosses. Ultimately, the game shines light on the dangers of mass surveillance and oppressive government oversight. It’s a short but unique experience, and a nice break from my usual JRPG or farming simulator gaming. Coolest Recent Purchase: I got new Yuri!!! on Ice and Digimon shirts. Plus my job doesn’t have much of a dress code, so I get to just show up looking like the anime geek that I am. Biggest Pet Peeve of the Moment: Having to wait for the new Snagglepuss comic to start. I’ve been hyped since it was announced, then the preview short came out at the end of the Suicide Squad/Banana Splits Annual, and I’ve heard no news since. I’m just excited and impatient.